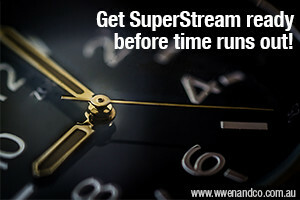 SuperStream – Time Is Running Out! SuperStream deadline is drawing closer. Do you need help to be ready? With only two quarters to go until SuperStream becomes mandatory, if you are an employer, then I urge you to prioritise crossing SuperStream off your actionable items list well before the 30 June 2016 deadline. using a clearing house (like the ATO’s free Small Business Superannuation Clearing House). What employee information will I need to be able to make contributions using SuperStream? their funds’ unique super identifiers (USIs). You then enter this data into your system ahead of the next quarterly due date on the 28 April. This will give you ample time to check that everything is operating correctly before the deadline. If you require any assistance with preparing for SuperStream, please contact our accountants at W Wen & Co’s Epping office.